Welcome to F4WOnline.com's live coverage of UFC On ESPN+ 1: Cejudo vs. Dillashaw, emanating from the Barclays Center in Brooklyn, New York. The Octagon heads back to Brooklyn for the dawn of a new era as the UFC premieres with its new broadcast partner, ESPN, in a much-hyped event headlined by a title fight with yet another world champion looking to become a two-division champion. 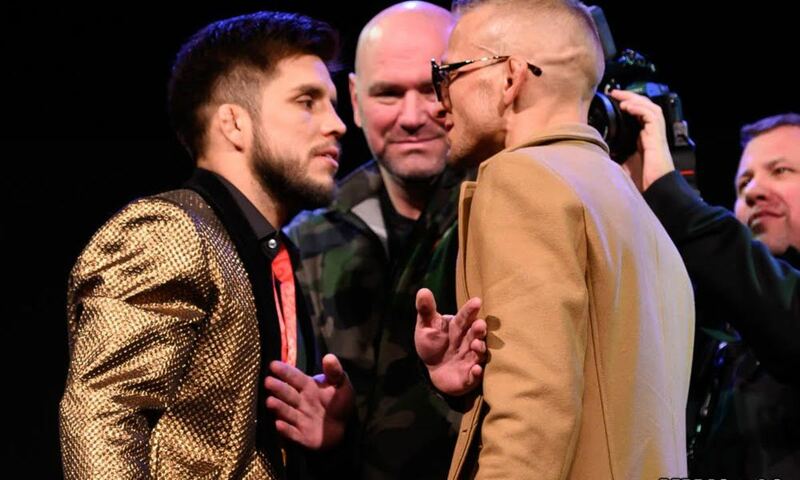 UFC Flyweight Champion Henry Cejudo makes his first title defense as he defends against UFC Bantamweight Champion TJ Dillashaw in the main event. Cejudo became champion in scoring an all-time upset of Demetrious Johnson at UFC 227 in August, while Dillashaw makes the drop down to 125 pounds looking to become the fourth double champion in UFC history. Dillashaw is a two-time UFC Bantamweight Champion and was last seen defending his 135-pound title in knocking out Cody Garbrandt at that same UFC 227 event in August. The main card for this event airs on ESPN+, the first UFC fights on their new streaming service, and will feature a heavyweight bout between the debuting Greg Hardy, a former NFL player with lots of controversy, and Allen Crowder. Also on that portion is a lightweight bout between Gregor Gillespie and Yancy Medeiros, a flyweight bout pitting Joseph Benavidez against Dustin Ortiz, and a women's flyweight bout featuring the return of Paige VanZant as she takes on Rachael Ostovich. ESPN will air their first UFC fights in company history with a four-fight preliminary card headlined by a lightweight bout between Alexander Hernandez and Donald Cerrone, who made UFC history in his last win to become the all-time UFC win leader. Also on that portion of the card is an exciting women's flyweight match-up that sees Joanne Calderwood welcome Ariane Lipski to the UFC. They trade right off the bat. Stewart with a low kick that hits the groin and we have a quick timeout. We get back to action. Rencountre gets a takedown and Stewart scrambles to the fence and gets to his feet. Rencountre has the back against the fence. He drags Stewart to the mat. Rencountre looking to set up a choke. Rencountre has the choke locked in now and Stewart taps! Big opening round win for Rencountre. Neal pressing forward early and switching his footwork. Both men being patient a minute in. Muhammad with some leg kicks but eats a left hand from Neal. Neal with a body kick followed by a leg kick. They trade in close range. Muhammad shoots for a takedown but doesn't complete it as Neal posted up and broke away. Neal with a left hand. Neal with a body kick against the fence. Neal lands an uppercut. They trade and Muhammad lands a kick. Neal with a high kick and lands a straight left hand. Muhammad with a flying knee that partially lands. Muhammad shoots but Neal defends the takedown. They clinch up to end the round. Close round. 10-9 Neal. Neal pressing forward and lands a left hand. Muhammad with a body kick but eats a left hand from Neal. Neal lands a series of hard punches on Muhammad. Muhammad lands a right hand. Neal lands a hard straight left hand. Muhammad shoots and gets a brief takedown but Neal scrambles to his feet. They trade in close range. Muhammad lands a left hand. Neal lands the jab but eats a punch from Muhammad. They are both landing good punches. Muhammad shoots again but Neal defends it. Neal lands a good combo. Neal with an uppercut followed by a left hand. Muhammad with a hard body kick and then a body punch. Neal lands some hard punches at the end that had Muhammad in trouble. 10-9 Muhammad, 19-19. Both men are throwing to start the third round. Neal lands a left hand. Muhammad shoots again but Neal stuffs it again. Muhammad hasn't been able to complete a takedown. Muhammad again shoots but Neal lands some left hands and then drops Muhammad with a left hand. Neal on top and lands some ground and pound. They get to their feet. Muhammad with a body kick. Neal lands a hard left hand. Muhammad is busted up on his face. Neal with a head kick that Muhammad checks. Neal with a massive head kick that stumbles up Muhammad. Muhammad gets back to his feet and throws punches. They trade hard punches. Muhammad has a chin on him. Neal with another high kick. Muhammad with a body kick. Great fight. 10-9 Neal, 29-28 Neal. Edwards with a leg kick and Bermudez lands one of his own. Bermudez clinches Edwards against the fence. Edwards lands a knee in the clinch. Edwards lands a head kick on the break and then lands a knee. Bermudez with a leg kick but Edwards hurts him with a punch and Bermudez goes down but recovers quickly. Bermudez with a sloppy takedown attempt that Edwards defends but Bermudez lands an elbow. Bermudez shoots again but Edwards defends. Bermudez lands a knee as they get in close. Bermudez continuing for a takedown but Edwards is defending. Bermudez lands a combo and shoots again and completes it. Bermudez with some elbows and punches from the top as he finishes the round strong. 10-9 Bermudez. Bermudez with a body kick and gets a takedown and is in the half-guard. Bermudez passes to side control and is attacking with a kimura attempt. Bermudez working hard for it as he has full side control now. He lets go of the attempt. Edwards gets to sprawl position and Bermudez has the neck. They get to their feet. Edwards with a couple of elbows as they break. Bermudez with a leg kick. Edwards lands a left hand. Bermudez gets a takedown. Edwards is doing nothing from the bottom as Bermudez lands a couple of punches. 10-8 Bermudez, 20-17 Bermudez. Bermudez with some leg kicks. Bermudez with an easy takedown and he lands a couple of hammerfists. Edwards gets himself locked into a guillotine choke and Bermudez has it in deep. Edwards trying to fight out as he keeps turning and is defending well. Bermudez gets to the full mount and is landing punches. Bermudez with a big elbow from the top and then some more elbows and punches. Edwards has nothing from the bottom. Edwards rolls into finding himself having to defend an armbar. Edwards steps out and they get to their feet. Bermudez goes right back for the takedown and finishes it. Bermudez on top but Edwards escapes and lands a couple of punches as the fight ends. 10-8 Bermudez, 30-25 Bermudez. Dennis Bermudez announced his retirement in his post-fight interview. Sandhagen with a high kick. They trade leg kicks. Bautista with a body kick. Sandhagen with more leg kicks. Bautista catches a leg and lands a right hand. Sandhagen with a combo to the body. Sandhagen drops Bautista with a huge flying knee. Sandhagen on top and lands some punches but Bautista grabs the body and gets to his feet and has the back of Sandhagen and slams him to the mat. Sandhagen locked Bautista into a triangle choke on the takedown and it is in deep. Sandhagen switches to the armbar and has it locked in and Bautista taps! Nice submission win for Sandhagen. Menifield with some big punches early as Moreira goes to the mat and eats more punches but they get back to their feet. Moreira with a spinning body kick. Menifield lands a combo. Menifield lands a right hand and then a combo. Menifield throwing some big punches. Moreira moves very slow on his feet. Moreira with blatant fence grabs. Moreira working for a takedown in the clinch. Menifield drops Moreira with a huge right hand and then finishes him off after some more punches on the ground. He has lots of potential at 205 pounds. Lipski with big punches early on and Calderwood grabs the clinch. They battle for underhooks against the fence. Lipski with some short knees. They break. Calderwood ducks under and gets a takedown. Calderwood with an elbow from the top. Calderwood passes to side control and transitions to the back. Calderwood looking for a choke but Lipski escapes. Calderwood on top and lands some short elbows. Calderwood now with punches from the top. Calderwood looking for an arm-triangle and almost had it locked in but Lipski escapes and gives up her back. Calderwood looking for a choke again. Calderwood looking for an armbar now. Lipski survives the round. 10-9 Calderwood. They trade strikes to start the second round. They trade leg kicks. They each land a right hand. Lipski with a body kick. Lipski with a body kick. Calderwood lands a right hand. They continue to trade in close range. Lipski lands a combo and Calderwood counters with a right hand. Lipski with an overhand right. They trade kicks. They trade hard punches. Both ladies are tired as the second round ends. Calderwood with a late body kick. 10-9 Calderwood, 20-18 Calderwood. Calderwood with some kicks to start the third round. They trade punches. Lipski lands a good combination. Calderwood with some kicks. Calderwood with a right hand but eats some punches from Lipski. Calderwood with some strikes in the clinch and Lipski is able to get a takedown into side control. Lipski working in the guard and now Calderwood attacking for the armbar. Calderwood almost had it locked in but Lipski defending well and spinning over. Lipski gets back into the guard of Calderwood. Lipski with short body punches but not going for the finish. Calderwood almost had an armbar in late. 10-9 Calderwood, 30-27 Calderwood. They trade punches to start. Hernandez lands a hard punch. They trade kicks and Cerrone gets a takedown. Hernandez trying to scramble but Cerrone keeps him down but Hernandez does get to his feet. Cerrone with a right hand. Hernandez lands the jab. They clinch and trade knees. Cerrone lands a right hand. Cerrone lands another. They trade punches. Cerrone lands a hard right hand. Hernandez with a body kick. Cerrone fires back with a combo. Cerrone with a head kick. Hernandez with some knees in the clinch. Cerrone with a combo. Cerrone lands a big knee followed by a right hand. Hernandez is bleeding. Cerrone with a big combo. Cerrone lighting Hernandez up on the feet. Hernandez is bleeding badly over his left eye. Cerrone with a body kick. Great round for Cerrone. 10-9 Cerrone. Hernandez with a front body kick. Cerrone misses a knee. They clinch and Hernandez looking for a takedown from a body lock. Cerrone with a leg kick. Cerrone with a combo. Cerrone with a big combo and Hernandez is hurt again. Cerrone with a big body kick. Hernandez is retreating. They clinch and Hernandez lands some punches but eats big knees from Cerrone. Cerrone with a big elbow. Cerrone with a combo. Cerrone drops Hernandez with a big head kick and goes into the guard. Cerrone with big right hands on the ground and he finishes Hernandez! Fantastic performance by Cerrone in this one. Roberson with a body kick. Teixeira looking for a takedown and eats some big elbows and falls to the mat. Roberson on top landing big punches and elbows. Roberson gets to the mount and lands some big punches. Teixeira able to scramble out and looks for a takedown as they get to their feet. He finishes it off and gets right to the mount. Teixeira landing some punches from the top and is working for an arm-triangle. Roberson able to get out. Teixeira back in the guard and lands more punches. He went right back for the arm-triangle and has it locked in and Roberson taps! Nice comeback from Teixeira has he was in a lot of trouble early in the fight. They clinch early and VanZant gets a brief trip takedown but they get up and Ostovich gets a takedown and is in the half-guard. VanZant just holding on from the bottom and Ostovich not doing anything and they are stood up. Ostovich lands a right hand and gets a takedown and is in side control. Ostovich has the neck of VanZant and is looking to pass the guard. Ostovich lets go of the neck. VanZant grabs the leg looking for an ankle lock but Ostovich rolls out. VanZant still has the leg and looking for a heel hook. Ostovich gets out and they get to their feet. Ostovich gets VanZant right back to the mat. 10-9 Ostovich. VanZant with a leg kick. Ostovich lands a right hand. Ostovich with another right hand and gets a takedown right off of it. Ostovich gets the back but VanZant scrambles out and gets the back of Ostovich. VanZant with back mount and landing big punches. Ostovich turns for a moment. VanZant still landing from the back. Somewhere Ostovich tapped out as the fight suddenly stopped from the back mount. VanZant got an armbar from the back as Ostovich was trying to slide out but the armbar was in deep and she tapped. Big win for VanZant. Benavidez with a body kick and then a leg kick but eats a combo from Ortiz. Benavidez with a left hand. Ortiz hurts Benavidez with a punch and goes for a takedown against the fence. Benavidez grabs the neck and Ortiz lands some short punches as they break apart. Ortiz with a high kick. Benavidez with a leg kick and Ortiz lands a counter right. Benavidez with a takedown. They scramble to their feet and clinch against the fence. Benavidez gets a takedown. They get to their feet. Ortiz lands a knee as they break. Ortiz with a kick but then gets dropped with a big left hand from Benavidez. Benavidez gets into the guard. Ortiz gives up his back but the round ends. 10-9 Benavidez. They trade punches and scramble to start the second round. Benavidez gets a brief takedown but Ortiz grabs the neck. They break. They trade and Ortiz lands a solid left hook. Ortiz coming forward more and lands a body kick. Benavidez working for another takedown and Ortiz landing some body punches to defend. Ortiz tries a takedown but it is defended. Ortiz gets the back. Ortiz gets a takedown and has the back. Benavidez is trying to circle out. They get to their feet. Benavidez lands a good left hand. Ortiz gets a takedown and has the back of Benavidez as they scramble and Ortiz gets a slam takedown and has the back and looks for a choke. He doesn't have it under the chin and time runs out on the round. 10-9 Ortiz, 19-19. Ortiz lands a solid right hand. Benavidez changes levels and gets a takedown. Benavidez moves to the back and they scramble and Ortiz reverses to the top and then takes the back of Benavidez. They continue to scramble and get to their feet and Benavidez has the back as they scramble back to the ground. Benavidez has the body triangle. Benavidez working for a choke but Ortiz is defending well and trying to explode from position and does. They get to their feet and Benavidez drags it back down. They continue to scramble as they get to their feet. Benavidez tries an ankle pick but eats body punches from Ortiz. Ortiz has the back and Benavidez lands punches. They get to their feet. Some fun grappling in this one. 10-9 Benavidez, 29-28 Benavidez. Gillespie goes right for the leg and gets a takedown as he gets back control. Medeiros popping back up to his feet. They scramble around and Gillespie still has the back. Gillespie landing knees to the body and head as he has body control against the fence. They scramble and Medeiros now has the back but Gillespie able to reverse. Gillespie gets a brief takedown. Gillespie gets another and Medeiros keeps being able to get up. Gillespie gets another takedown. Medeiros is able to get up but Gillespie keeps grinding and is all over Medeiros. Gillespie with more knees. 10-9 Gillespie. They trade punches to start the second. Gillespie lands a right hand. Gillespie shoots and Medeiros defends against the fence. Gillespie with a brief trip takedown and now has the back. Gillespie gets to the top and has the mount and is working for a possible choke. Gillespie with an elbow and starts to land punches. Medeiros trying to turn out. Medeiros gives up his back and Gillespie landing punches. Big punches from Gillespie. They get to their feet. Gillespie gets the back and is landing big punches and the fight is stopped with seconds left in the second round. Wow. Big finish by Gillespie in a dominant showing. Hardy landing big punches early. Crowder went right after him. Hardy landing more punches. Crowder clinches. They break. Hardy with a left hand. Hardy with a leg kick. Hardy slowing down as this is now his longest career fight. Hardy with a knee but Crowder reverses it into a takedown. They start to get up but Crowder plants Hardy back down and gets into side control. Crowder into the crucifix position. Hardy scrambles to his feet. Crowder leaning on Hardy and attacks with a guillotine and slips down and Hardy now in the guard. Hardy with some hammerfists. Crowder with an elbow from the bottom. They get to their feet and Hardy lands a big right hand at the end. 10-9 Crowder. Both men are tired. They trade punches. Crowder lands a right hand. Both throwing at the air right now. Crowder taunting Hardy and lands some punches. That seemed to faze Hardy though Hardy lands an elbow. Crowder tries a takedown but Hardy defends. Hardy then landed an illegal knee on Crowder and Hardy even landed a punch after the referee stepped in. It was a blatant illegal knee. This fight is over and Hardy is being disqualified. Crowder's knee was clearly down as Hardy was holding him down. Hard to say if it was intentional but it did look malicious after it came after the taunting from Crowder and a bad chant from the fans directed at Hardy. Crowder is getting the win here. Dillsahaw tries something quick but Cejudo hurts him with a right hand. Cejudo has Dillashaw in a ton of trouble. Cejudo has Dillashaw in a lot of trouble and drops him again with another punch and lands more punches and the fight is stopped. Wow. Cejudo finishes Dillashaw in less than a minute. Cejudo remains the champion. What a finish by Cejudo.